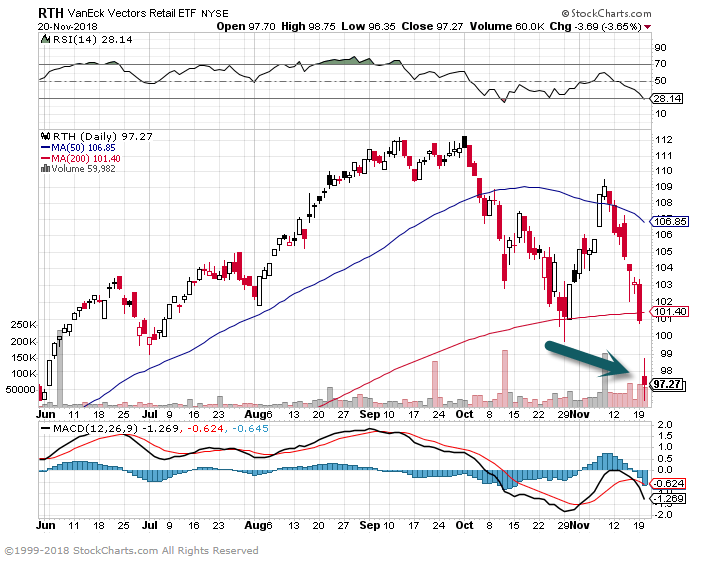 1.Retail Stocks Technical Damage….Sales Good Costs Higher …3.7% Unemployment. 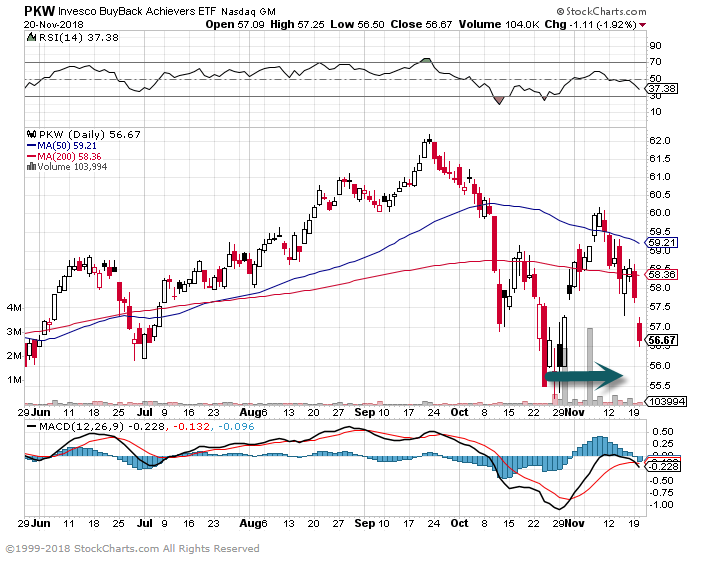 Daily Chart Closes Below 200 Day. 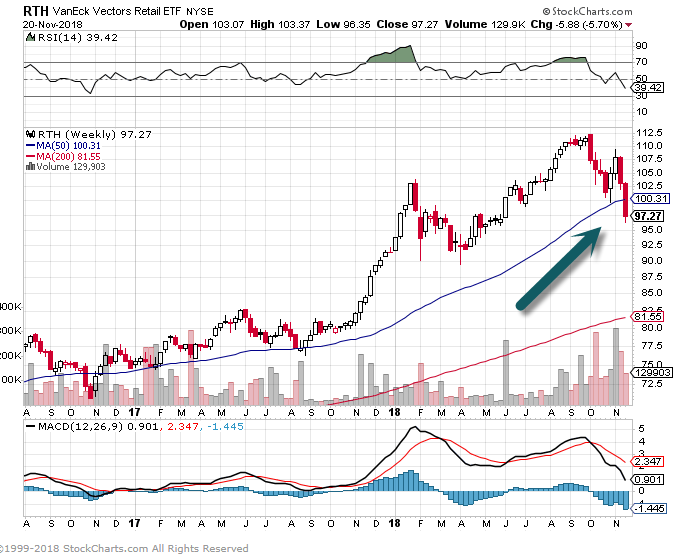 Weekly Chart Closes Below 50 Day. 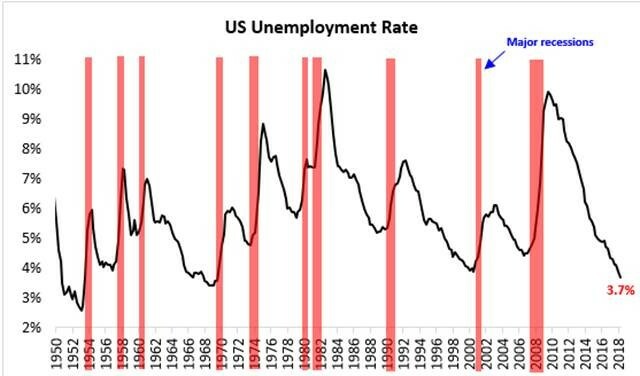 3.Unemployment Rate Versus Past Recessions. 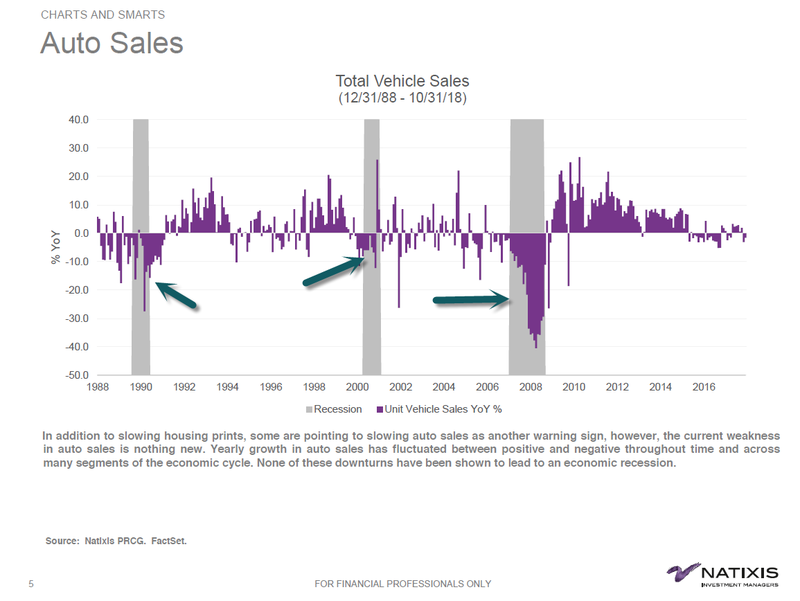 4.Auto Sales Versus Past Recessions. 5.The True Question…Has Earnings Growth Peaked? 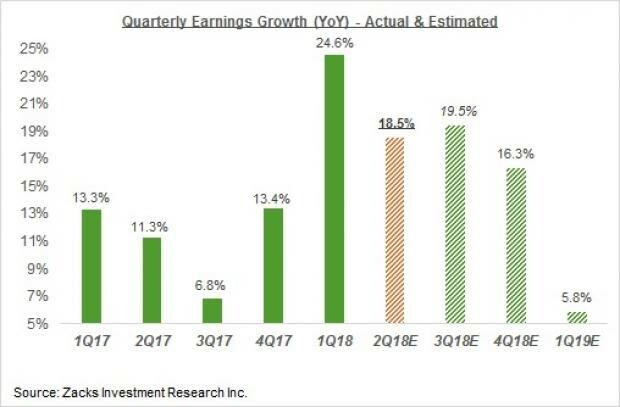 The chart below compares current Q2 earnings growth expectations with what was actually achieved in the preceding 5 quarters and what is expected in the following 3 quarters. 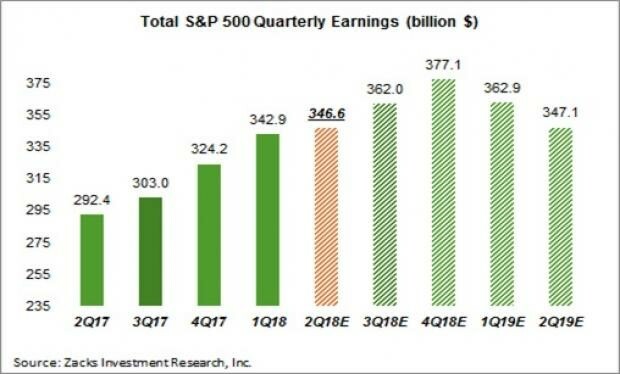 Please note that while the Q2 growth pace represents a deceleration from the preceding quarter’s impressive level, the overall level of total earnings is in record territory, as the chart below shows. 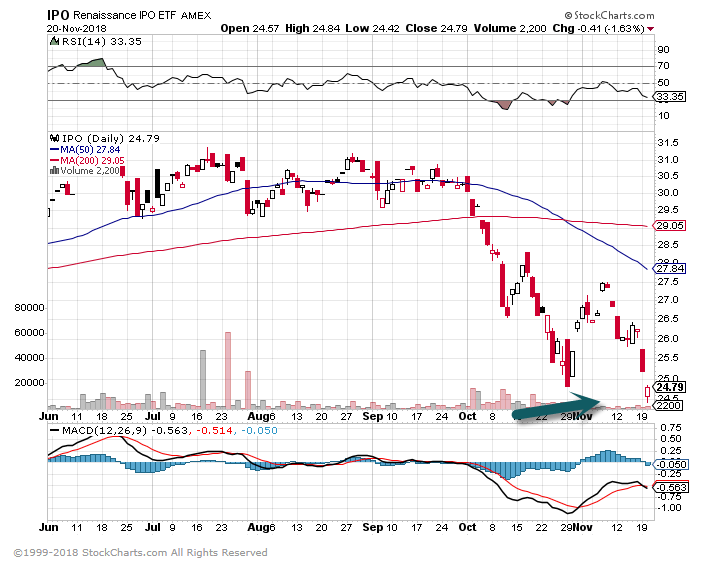 The two charts above provide different answers to the ‘peak earnings’ question. The first chart shows that the growth rate likely peaked in 2018 Q1, while dollar earnings aren’t expected to ‘peak’ till the last quarter of 2018. Even with respect to the growth rate, it is very much possible that final growth rates for Q2 and Q3 may surpass what we saw in Q1. 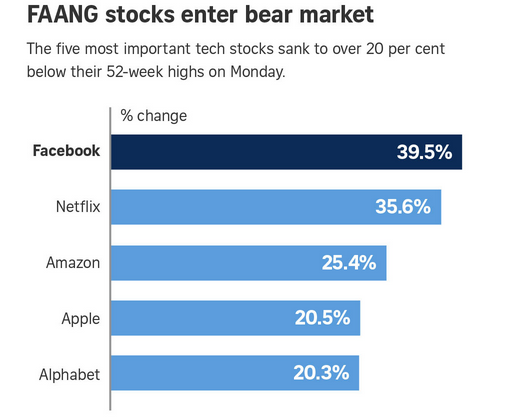 6.Three Horseman of Bull Market-IPO, Spin-Offs and Buybacks. IPO index new YTD lows. 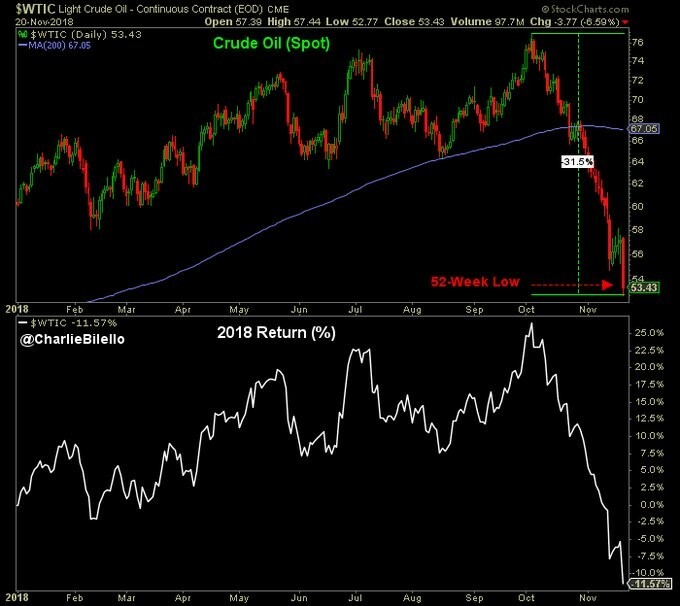 Spin Off index new YTD lows. 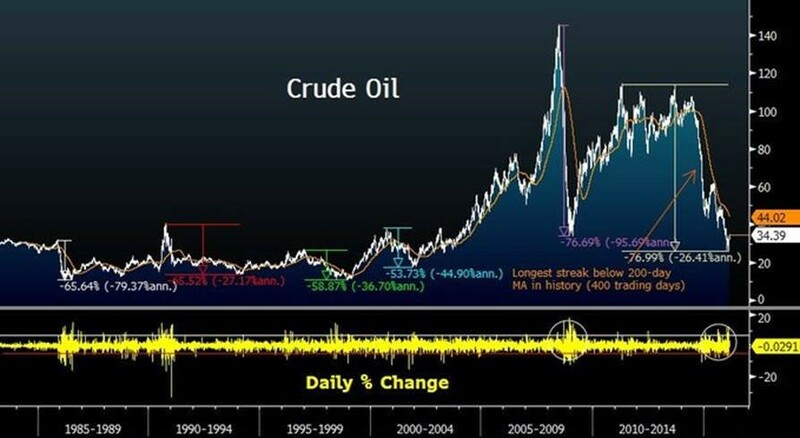 7.Crude Dow 31% From Highs….Sell Off Versus History. 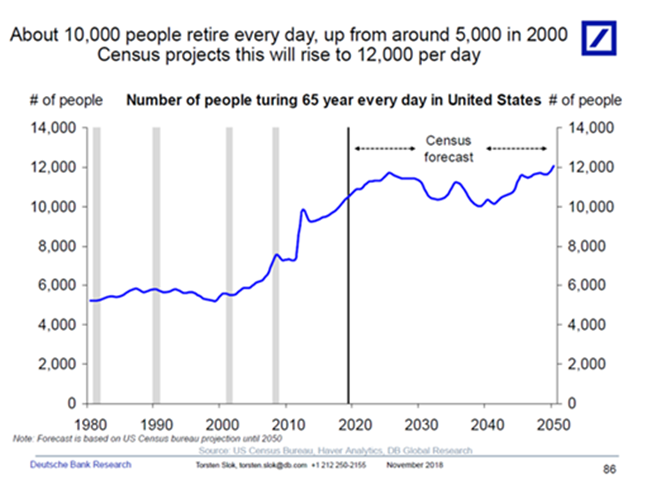 8.Number of Americans Retiring Per Day. The number of Americans retiring every day has increased significantly over the past decade. This has significant implications for health care costs, 401(k) savings, and average wage growth, see chart below. 9.GE is the World’s 6th Most Indebted Company. The third difference is broader, and more worrisome. Back in 2005, nonfinancial corporate debt was relatively small; at the end of the year the amount of bonds and other debt securities outstanding was the lowest relative to GDP since 1993. Sure, huge debt problems were building up, but in the U.S. it was mainly in banks and the financial sector. This time the opposite is the case. U.S. banks have cut their leverage and built their capital and liquidity buffers since 2008, while nonfinancial companies have been on a borrowing spree fueled by cheap money. With more leverage and fewer protections, the debt markets are more vulnerable to a shock today than they were, so a GE downgrade could end up more serious than the 2005 fright. 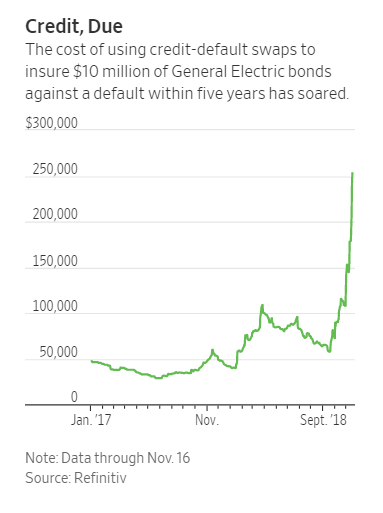 Indeed, many were already worrying that excesses in leveraged loans—a type of highly-geared floating rate debt typically used in private equity buyouts, not issued by GE—could significantly worsen any economic downturn. 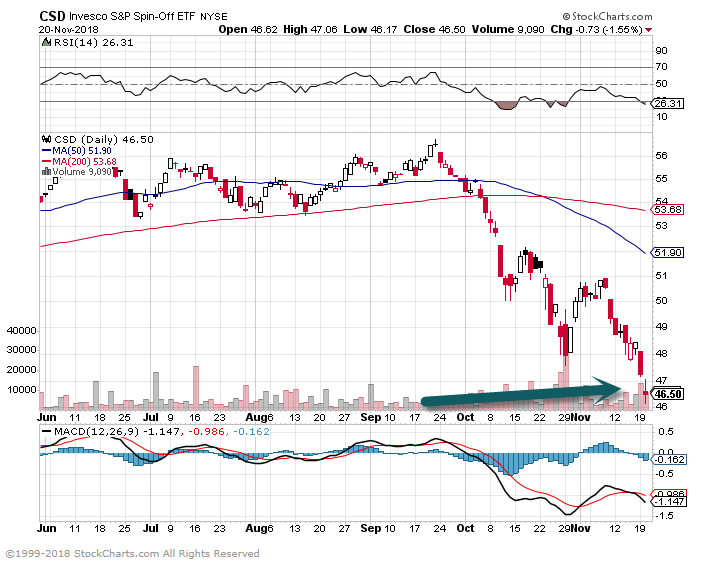 Hopefully GE will end up merely as a case study in financial mismanagement, rather than the trigger for messy markets. I’d expect only a short period of turmoil, rather than serious trouble, if GE is downgraded—but I do fear that the overall debt load will hurt a lot in the next economic downturn. You’ve had your head down all week, pitching clients, writing proposals, launching marketing campaigns, meeting with team members, and writing content. To the outside observer, you’ve been a productivity machine! Yet… when Friday rolls around, you find yourself drained and exhausted, suffering from a sense of dread and hopelessness that stems from an unidentified source. You’re good at your job and the caliber of your work regularly garners compliments from colleagues and clients. You’re financially stable and have escaped the paycheck-to-paycheck rat race. In fact, your numbers have been trending upwards for years and you’re on track to hit some massive milestones. Heck, you really like what you do for a living and find great pride and satisfaction in your work. Despite all of this, you feel like something is missing. Although you can’t pinpoint exactly what is lacking in your life, the overwhelming sense of existential angst is ever-present and inescapable. Like old gum on a shoe, try though you may, you can’t seem to escape this profound emptiness in your life. If this sounds familiar, don’t worry. Despite all of your external successes, you lack a concrete purpose for your life. Since the dawn of time, there have been two age-old questions humans have asked themselves. Science can help us answer the first question. But only you can answer the second. Today I want to show you how a single Japanese word helped me discover my purpose for living and how you can leverage it to find your life’s purpose today. Today, I want to help you uncover that “Why” so that you can achieve unprecedented levels of success, happiness, and fulfillment. Sound like a plan? Then let’s begin. I was first introduced to this concept by the book Ikagai by Héctor García (what an original title, right?). In his book, Garcia posits that every human has a purpose for their life. However, some of us seem to uncover that purpose easier than others. Others struggle so profoundly to find their purpose that they disregard the concept entirely. In our modern society, it’s all too easy to buy into the lie that we have no purpose. That life is meaningless and our sole reason for existence is to “Eat, drink, and be merry”. However, for those of you sitting back in your chair with your arms folded thinking to yourself, “Really? A life’s purpose… How woo-woo and ridiculous does it get?”, it might behoove you to consider some of the findings shared by Garcia and his team. During the course of his research, Garcia traveled all over the globe to areas known as “Blue Zones” (places with the highest number of centurions – people older than 100) to interview long-lived individuals and uncover their “secret” to longevity and happiness. Eating a Healthy Diet: The bulk of their diets consist of vegetables and unprocessed meat (kind of a no-brainer). They Exercise Regularly: Most of the time simply walking to get your food or meet your friends (again, no surprises here). I found this discovery utterly fascinating. Although clean eating and a healthy lifestyle seem to be inextricably tied to a long and happy life, I was surprised that having a clear purpose was one of the top three longevity factors cited by centurions. So before you discount this article and exercise entirely, consider what’s really at stake here. Finding and following your purpose could literally mean the difference between an early death and living to a happy and healthy 100-years old. Good. Let’s dive into the exact framework you can use to discover your purpose (and hopefully live to 100) today. In order to find your Ikigai, you need only answer 4 simple questions. What do you love?What sets your soul on fire? What makes you come alive? What would you do for free every single day if money were no object? What are you good at?What skills, talents, and abilities earn you regular compliments? What things come easily to you? What can you be paid for?Being skilled at and enjoying a particular activity does not necessarily mean you can monetize that activity. Which passions/skills can earn you money? What does the World need?Even if you love something, possess a natural skill for it, and can be paid, that doesn’t mean the world needs what you have to offer. What problems do other people have that can you solve using a skillset taken from the above questions? Really sit with these questions. Don’t just breeze through them and assume that you will find your purpose easily. If at all possible, I recommend going camping for a long weekend and spending some time alone in nature pondering the answer to these questions. Once you’ve answered these four questions, ask yourself a fifth, and final question. Where do the answers for all of these questions overlap? What could you do that you simultaneously love, are good at, can get paid for, and is needed by the world? It’s important to note that this is not a “set it and forget it” exercise. Your life’s purpose is a moving target, constantly evolving and changing shape as you go through your journey of personal development. As the years go by, and you acquire new skills, passions, and the world develops new needs, it’s important to revisit this exercise so that you stay on target and on FIRE with purpose. I recently had the pleasure of sitting in a mastermind with Chris Wark, author of “Chris Beat Cancer”. While we were all socializing after the event I started talking with him more about his journey and story. To give you a very brief synopsis of Chris’s story, he was diagnosed with stage 3 colon cancer (a diagnoses typically considered to be terminal) when he was only 26. Instead of resorting to traditional treatment methods like chemotherapy, he threw himself into the world of alternative cancer treatments and was able to achieve full remission using only natural “remedies”. While this feat is undoubtedly impressive, what I found even more impressive about Chris was his strong purpose for living and the tangible vibrancy that he had for life. When viewed through the four-step Ikagai framework, it was easy to see why. He was PASSIONATE about helping other people beat cancer without expensive and debilitating procedures. He was SKILLED at alternative cancer treatments due to his own experience and success. He can easily get PAID to help people treat cancer naturally. And the world NEEDS what he has to offer more than ever before. I suppose that the final, and possibly the most important lesson I learned from Chris’s story is that our life’s purpose is often hidden behind the doors of pain and struggle. Chris had no idea that he would one day become one of the industry leaders in the field of alternative cancer treatments and I can all but guarantee you that he wasn’t thinking about his “life’s purpose” when faced with his diagnoses. Yet step by step, day by day, little by little the greatest pain and heartache he ever experienced was transmuted into his very purpose for living. What about you? What great struggle or pain have you experienced in your life that might hold the key to your life’s purpose? What seemingly terrible trauma, accident, or injury have you experienced that could be the very path leading to your reason to exist? Never forget that pain is often our greatest teacher and our truest guide. Re-frame the pain and struggles you’ve experienced and start to look at them through the lens of purpose and impact. The worst thing that has ever happened to you might be the very thing that allows you to leave a dent in the universe and leave this planet with a sense of peace and content. When you are clear on your life’s purpose you can filter a lot of your toughest decisions through your Ikigai to understand if the end result will get you into your flow. Having a clear purpose will lead to more happiness, more wealth, more true-life experiences, and an overall healthier life. But don’t stress out if you are unclear on your purpose. Remember it’s a moving target and nothing something you can create. Your true Ikigai must be discovered. Pay close attention the next time you find yourself doing work you genuinely enjoy and see how it aligns with your purpose in life. At the end of the day, we all want purpose and meaning in our lives. It is up to you to actively discover yours. I hope the Ikigai exercise helps you as much as it helped me.